Since our beginning in 1996, our motto here at Gutter Helmet® of Myrtle Beach has been to be a true professional in both sales and service. And we do what we say! In April 2004, we opened our doors to a greater service area and are now proud to bring our product and service offerings to over 2,000 homes and businesses in Horry County, Georgetown County, Williamsburg County, Brunswick County and New Hanover County. Our growing pool of satisfied clients is the best testament to our team’s obsession with excellence. 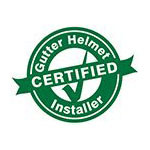 In line with our commitment to true professionalism, Gutter Helmet® of Myrtle Beach offers fast turnarounds, fully trained installers and service representatives, topnotch workmanship and exceptional after-sales service. Our team is 100% focused on providing a 100% satisfactory customer experience. Part of that 100% satisfactory customer experience is the assurance that you’re getting the highest quality products for your money. That’s why we offer Gutter Helmet®, America’s #1 choice in gutter protection for more than 30 years. It is a product we—together with millions of homeowners across North America—truly believe in. Besides gutter protection systems, our technical crew is also trained to install premium seamless gutters and SunShade retractable patio awnings by Gutter Helmet®. Call (800) 824-3772 today to learn more about Gutter Helmet® or fill out our online form to schedule an in-home appointment with one of our representatives. We look forward to addressing all of your questions and concerns.